The Pacific Ocean climatic event ENSO stands for the El Niño Southern Oscillation. In reality, El Niño is only one phase of a two phase system. La Niña is the counter part to El Niño, yet received less attention early on. Therefore the oscillations of temperature anomalies asymmetrically bare the name El Niño. The area of concern includes Pacific waters off the coast of peru and Ecuador. Regional fluctuations 0.5 degrees above or below the accepted norms trigger the label of this event. The ocean temperatures and circulation patterns are related to and directly effect the overlying atmosphere of the tropical Pacific which in turn are linked to ENSO. ENSO is usually identified in the summer with conditions disappearing by springtime. However, in the summer of 1970 temperature deviations appeared and persisted continuously until summer of 1976. And there are many other recorded events lasting longer than 18 months. El Niño tends to show weakened Pacific trade winds associated with warmer ocean temperatures off the the Northwestern Coast of South America. This area is basically centered on the equator and covers many many thousand of square miles of ocean. These waters are normally kept cool by upwelling of deep cold ocean water to the surface. 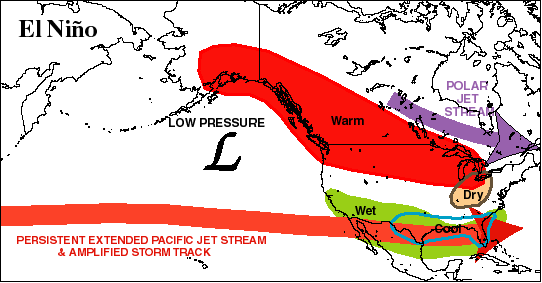 For the U.S. we see the south-ward movement for the jet stream, bringing cooler, damper conditions into the southwest during the winter months. Flatting out of the jet stream across the U.S.
La Niña is simply the cooling or opposite trend in temperatures over this stretch of the Pacific. Related higher intensity trade winds can magnify La Niña as they tend to push warm waters away from the equator. This allows an increase in the normal upwelling of cold waters from the deep to replacing the blown out warm waters. Amplified wave in the jet stream across Eastern Pacific and the U.S. 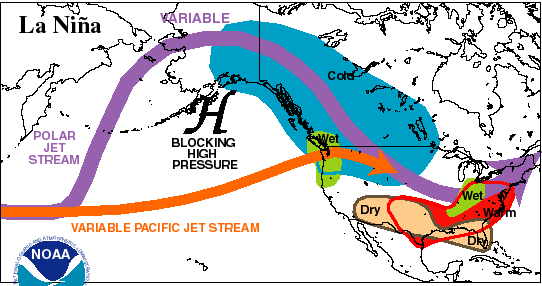 Variable jet stream strength in the NE Pacific coupled with average jet stream position farther north than normal. Historically La Niña has proved to be more consistent which makes weathermen happy because they get to be right more often than usual. If fact regionally, in the Southwestern U.S. dry winters have persisted for the last 65 La Niña episodes without exception. Beyond the four seasons, ENSO may be our next opportunity to reliably predict weather. Unlike the simplicity of predicting colder winters and warmer summers, the computer models needed to take into account the huge number of variables to accurately predict ENSO are mind boggling. El Niño literally inspired scientists to develop the modern climate computer model which has ushered in a new age of climatology. To learn more about how El Niño and La Niña effects the weather in South Padre, check out the historical wind data for SPI, as well as the current wave and tide charts, or air and water temperatures.